Even though I've read this book a few times before, it's just as good as the first time. 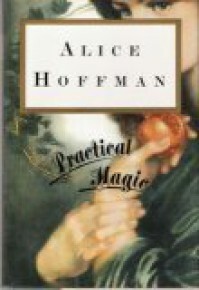 Alice Hoffman has what I call a cinematic style of bringing fairy-tale-like narrations to contemporary story and setting, specifically New England. So it's no surprise when this book was turned into a movie not long after publication. As a matter of fact, the movie is better known than the book. There are people who still don't know that it's only an adaptation. - What I've always liked about this book is that it stays true to the traditions of fairy tales in that consequences are serious and often times permanent, ugly, and have a way of catching up to you. No action goes unpunished. - What I've come to like and understand about the characters in this book is that Hoffman writes female characters in her own particular way. Although these characters are grounded in their emotions and repeatedly influenced by mysterious magical entities, they seem most realistic, most relateable, when they are at their most vulnerable moments. - What I still don't like about the story is how Jimmy's ghost is dealt with so easily just by having the aunts come to Sally's house and whisking him away. I enjoy the haunting and darker elements of the story up until this point. - Both the book and movie are different enough for each to stand on its own. - What the movie has, and the book lacks, is a fun sunny New England atmosphere, whereas the tone and atmosphere in the book are dark, foreboding, though still New England. - Sally and Gillian, as portrayed in the movie, lack the depth, devotion, and connection that Sally and Gillian in the book have; however, the movie makes up for it by showing the sisters' stories as they unfold, instead of telling, which is what the book does in much of the narration. - Magic and the Aunts play bigger roles in Sally's and Gillian's lives here and adds a closeness and a familial layer to the story that isn't in the book. This story translates very well to audio. It's as though it was written to be read aloud.